Hurray! What a fabulous week we had last week over on Family Fun with our greatest number of linkers yet and many new friends. It was great to welcome the #TribalChat ladies and thanks for your support! Great to see so many lovely blogging friends returning every week. I really appreciate it! There was such an amazing mixture of posts last week and I loved many but the one that really touched me came from the lovely Ann over at Rainbows are too beautiful. Ann wrote a post that really resonated with me. Please pop over and check it out if you missed it last week. Feel free to grab my I was post of the week badge. 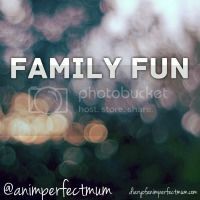 This week I am linking up two posts: Autism is... a presentation by my 10 year old son and Family Fun at the Goat farm. I hope you enjoy them. A little reminder to comment on 1 host post and the post before yours and at least 1 other. Thank you! If we pass on the love we get it back. And put a badge on it please friends.